Forget the underwater vintage sea town that was BioShock's Rapture. 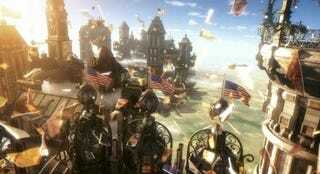 The latest game, BioShock Infinite, is a mind-trip set in the skies. Check out the latest trailer, which is set in the city built on the backs of blimps. BioShock Infinite is set in the early 1900s in the city of Columbia. And as you can see, the whole thing is hovering above the Earth, thanks to a collection of blimps and other early 20th century flying machines. Columbia was supposed to be a "floating world's fair" celebrating post-Civil War American achievement and patriotism. But, like many floating cities before it, nothing is what is seems to be in Columbia. For more information head over to our sister site Kotaku, which was front and center at the BioShock reveal, and has a detailed run-down on Columbia.